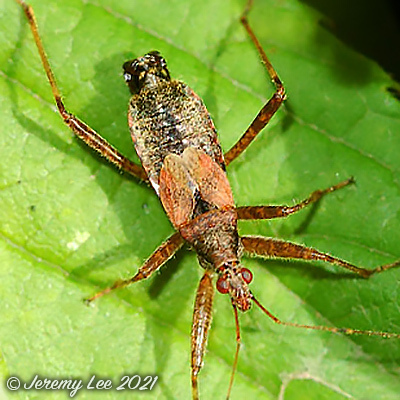 Himacerus apterus is a member of the insect family Nabidae, which contains the damsel bugs. The terms damsel bug and nabid are synonymous. There are over 400 species. They are soft-bodied, elongate, winged terrestrial predators. Many damsel bugs catch and hold prey with their forelegs, similar to mantids. They are considered helpful species in agriculture because of their predation on many types of crop pests, such as cabbage worms, aphids, and lygus bugs. Damsel bugs of the genus Nabis are the most common. They and other genera are most numerous in fields of legumes such as alfalfa, but they can be found in many other crops and in non-cultivated areas. They are yellow to tan in color and have large, bulbous eyes and stiltlike legs. They are generalist predators, catching almost any insect smaller than themselves, and cannibalizing each other when no other food is available. www.uknature.co.uk is a website dedicated to showing the immense diversity of UK nature and wildlife. Our vast range of habitats, from lowland arable to snow covered mountains, from storm-ravaged coastlines to peaceful inland freshwater lakes and rivers, from dry, sandy heaths to deciduous and coniferous forests, all these habitats contribute to the abundance of UK nature. We have wild birds in huge numbers either residing or visiting our shores (597 recorded species as at July 2013) and we must also not forget the humble back garden with its grass lawns, flower beds filled with nectar rich flowers, shrubs and trees, all designed to attract huge numbers of insects such as bees, moths, butterflies and hoverflies; and finally the small ponds which provide safe havens for frogs, toads, newts and even slow worms and grass snakes. www.uknature.co.uk is the showcase for my personal passion, photographing uknature in all its glory. I sincerely hope you all enjoy the fruits of my labours.